"Celebration of Quilts - 45 Years in the Making"
Quilt Show Committee Chairs: The official list. Quilt Registration: Fill out one form for each quilt you will enter. Submit completed forms to Mary Lee St. Aubin at a meeting or by mail. Registration forms will be accepted February 27 - May 31, 2019. To print the form and instructions, click the links below. Members' Challenge Quilts: The theme of this year's challenge celebrates the year the guild was started. "The Top 100 Billboard Hits from 1974"
Choose your song from the official list. Send your choice to the Challenge Quilt Chairs: Faith Styles and Chris Cohen. If your song is already taken, they will ask you to select another. The requirements and instructions for your challenge quilt can be found here. 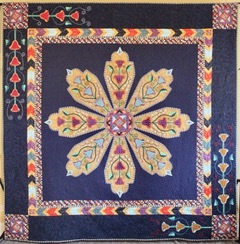 Janet Bingle Award: In October 1991, the Faithful Circle Quilters honored Janet Bingle with an award for founding our group, inspiring our members to fulfill her vision of sharing quilting with others. To further honor Janet, the Janet Bingle Award was established to recognize a Faithful Circle Quilter who has provided exceptional leadership, effort, and time. The award recognizes one who has promoted, stimulated, educated, and enhanced the art of quilting in all its various forms. Traditionally, at the conclusion of each FCQ quilt show, one Faithful Circle Quilter has been presented with this award. The 2019 awardee will be honored at the October 23rd meeting, The FCQ Quilt Show Wrap Up. Previous awardees include Chris Kinka (1993), Marilyn Bushman (1995), Rita Ptacek (1997), Judy Teska (1999), Paula Hitz (2001), Connie Gaul (2003), Kathy Nybo (2005), Marla Kuettler (2007), Coleen Walter (2009), Jan Keller (2011), Joan Bratton (2013) Annabelle Jankowiak (2015), Barbara Rathke (2017). This award may only be won once. 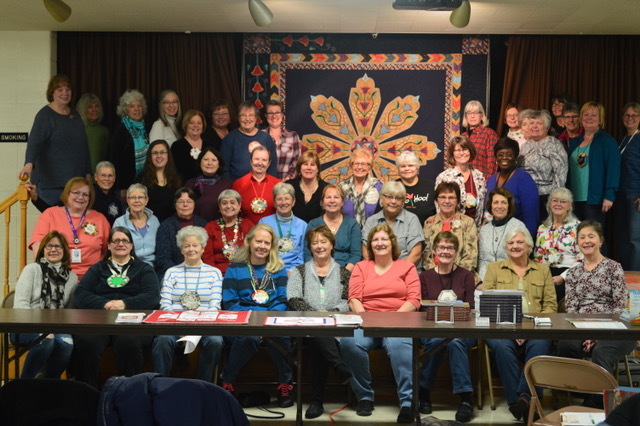 These women have held many board and committee positions throughout the years, helping to build the 200 strong Faithful Circle Quilters we know today. Mail or email your completed form by August 28, to Barbara Rathke.